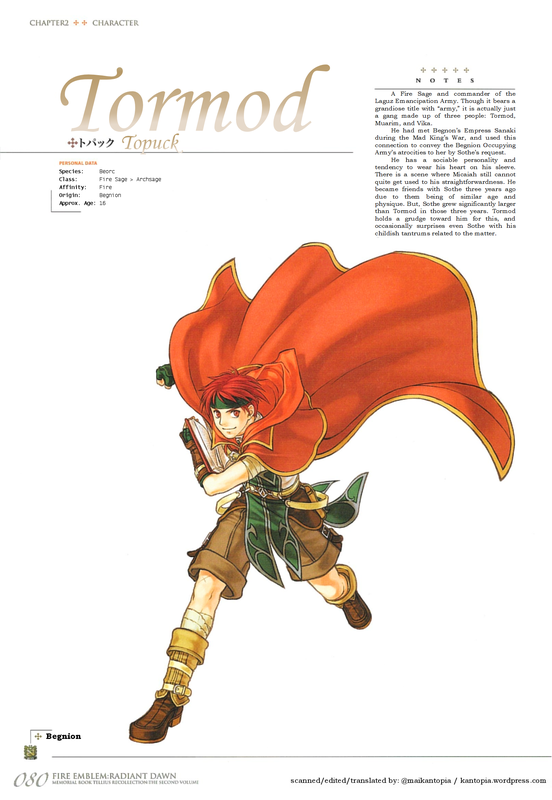 This post features Tormod, a returning character from Path of Radiance. A Fire Sage and commander of the Laguz Emancipation Army. Though it bears a grandiose title with “army,” it is actually just a gang made up of three people: Tormod, Muarim, and Vika. He had met Begnon’s Empress Sanaki during the Mad King’s War, and used this connection to convey the Begnion Occupying Army’s atrocities to her by Sothe’s request. He has a sociable personality and tendency to wear his heart on his sleeve. There is a scene where Micaiah still cannot quite get used to his straightforwardness. He became friends with Sothe three years ago due to them being of similar age and physique. But, Sothe grew significantly larger than Tormod in those three years. Tormod holds a grudge toward him for this, and occasionally surprises even Sothe with his childish tantrums related to the matter. This entry was posted in Artbook, Fire Emblem, Translation, Video Games and tagged background, character, character design, concept art, Gamecube, guidebook, intelligent systems, japanese, memorial book, nintendo, path of radiance, radiant dawn, tellius recollection, tormod, Trivia. Bookmark the permalink.